China Glaze sent out the press release for Vintage Vixen and I am excited about these! If you haven't entered my Vintage Vixen giveaway and you'd like to, the details can be found in the top right corner under May Monthly Contest. I love this era, and the names of the polishes are perfect. If you're following China Glaze on Twitter, they have started showing swatches from this collection as of today. You can follow them on Twitter here. 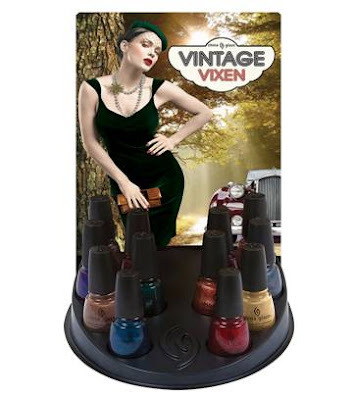 For Fall 2010, the China Glaze vintage Vixen Collection captures the vivid and saturated hues of the 1940's with this seductively complex palette. These classic shades of the season recreate the timeless tableau of movie land mystique, perfect red pouts, and steamy nights where swing was the scene! This collection begins shipping June 6th Internationally, and July 6th Domestically. OH NOO! "frost with shimmer/glitter", i'm so let down, i was hoping a zoya sparkle finish, or even ruby pumps finish..but anyway will wait to see if i change my mind. Liz~July will bring us more fun, won't it? I haven't seen too many other Fall collections yet, but I'm looking forward to this one! Julie~I thought the same thing, but I'm going to wait until I see more pics. The ones I've seen so far don't necessarily all look frosty to me. Amy~I know, I think we'll like them (I hope! ).